Well, it is not impossible to find after all. The better way to get there is to turn south off Hwy 12 at Reeves Rd and drive south to Granny White's Side Road and turn left (East) and drive about 200 metres. You will see on the left or north side of the road a very badly faded blue historic site sign. Turn left (north) immediately at this sign. There are gates but they were open today. I have no idea when they are closed. As has been pointed out, take that immediate turn, just a few feet further to the east is a private drive and you don't want to go in there. The narrow dirt road runs 0.5 km with tall wire fencing on both sides to a small opening in the woods where the stone monument stands. There is enough room for a car to turn around. The space is quite a bit smaller than at St. Ignace II. There is not a great deal to see. Still to drive to the spot is an attempt in a small way to travel back in time to 1649. As you drive in some of the land on the east side falls away from the road. One argument for the site I suppose is the proximity to the creek a little further to the east. St. Ignace II is also located near to a creek. The story of St. Louis according to Bruce G. Trigger, The Children of Aataentsic: A History of the Huron People to 1660, is significant. 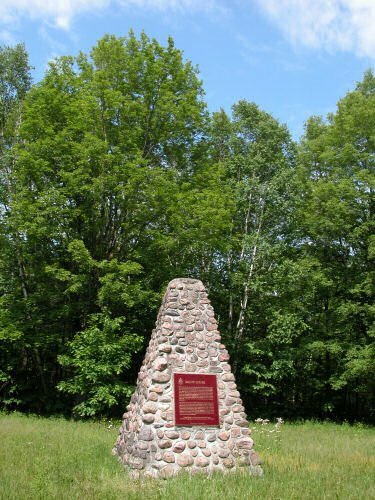 The Iroquois army (mainly Seneca and Mohawk, over 1000, well supplied with firearms and ammunition) captured the village on the morning of March 16th (?). 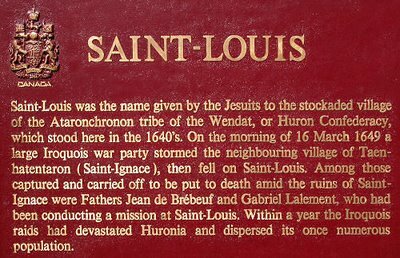 After the torture and death of Brebeuf and Lalemant, on the 17th, a group of Huron attacked an advance party of 200 Iroquois headed for Ste. Marie. After losses on both sides the Huron forced the Iroquois back to St. Louis and took possession of the village, capturing some 30 Iroquois. 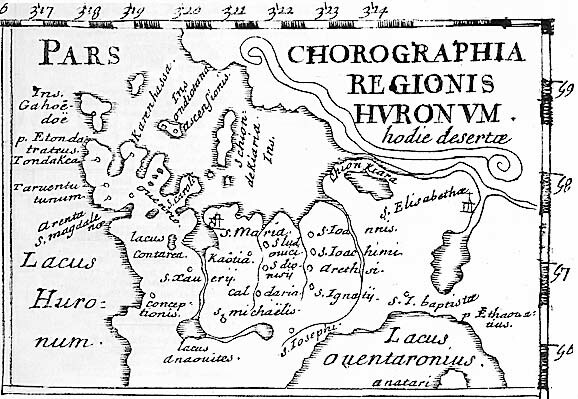 The main party of the Iroquois returned to the village and a long battle took place. Some 100 Iroquois were killed. After their heavy losses at the protected battle to retake St. Louis, the Iroquois regrouped and decided to retreat (Trigger, pp. 763-766).